Antique chandeliers have come a long way since the simple wooden affairs made in the Middle Ages. Ever since the 18th Century, some of the most skilled craftsmen in Europe and the world have turned their hand to chandelier-making, producing ever more intricate, ornate, and beautiful chandeliers. Here we count down ten of our favourite chandeliers from across the ages: old chandeliers, new chandeliers, huge chandeliers, silver, glass, gilt bronze and crystal chandeliers. We start with a chandelier attributed to perhaps the most famous furniture maker in history: Andre-Charles Boulle (French, 1642-1732), chief ebeniste to the King Louis XIV. Although known mostly for his furniture, and especially his distinctive style of marquetry, Boulle also came up with a number of designs for chandeliers in the late 17th Century. In doing so, he revolutionised the world of chandelier making: working in ormolu, or gilt bronze, Boulle created chandeliers with astonishingly intricate levels of ornamentation. Moreover, the gilding would reflect the candlelight to give off a brilliant yellow glow. His designs were the epitome of the Baroque style. This eight light chandelier is displayed at the Met Museum in New York, where it serves as an example of the work one of the finest craftsmen to have ever lived and the dawning of a new age in chandelier production. 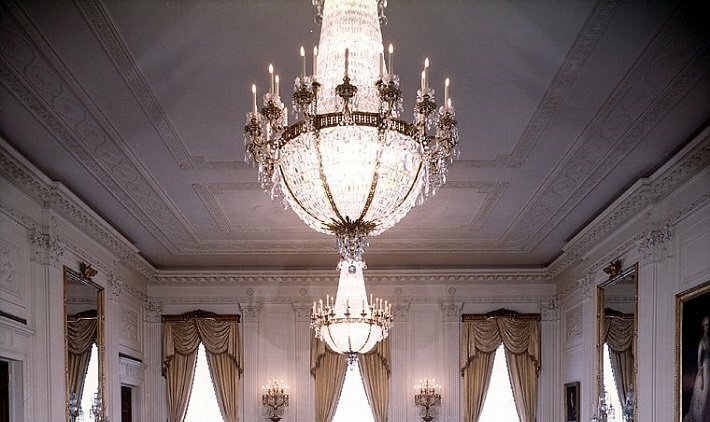 So this is actually three chandeliers, rather than one, which may be cheating, but the lighting fixtures which hang in the East Room of the White House are really quite special: not only in their design, but in their fascinating history. Indeed, anyone who has made it into the history books in the last 100 years has probably stood underneath these chandeliers at some point: kings, queens, heads of state, billionaires, philanthropists, celebrities. The East Room is traditionally used for important conferences, ceremonies and banquets - it's where the President does his or her entertaining, and so needs suitably splendid lighting fixtures. The East Room chandeliers were commissioned by President Theodore Roosevelt in 1902, during a major renovation of the White House. They were made by the firm Christoph Palme & Co., Parchen, from Bohemia (then part of Austria-Hungary), a region renowned for the quality of its glass ware. Bohemian glass chandeliers had long been regarded as the finest quality money could buy, and these gilt brass and crystal chandeliers spared no expense, each using over 6,000 pieces of individually cut glass and weighing over half a ton. In fact, they were so large and impressive that successive Presidents have tried to have them shortened, claiming they overpowered the room. The islands of Murano near Venice may be small, but their impact on the history of chandelier making has been phenomenal. Murano glasswares have been some of the most highly coveted since the Middle Ages, and their chandeliers have at some point adorned the palaces and residences of nearly every major European aristocrat. All of this is quite impressive - especially for a region with a population of just 5,000! In the mid-18th Century, the only real competition to Murano chandeliers were the crystal chandeliers produced in the region of Bohemia. While Bohemian chandeliers (as seen in East Room chandeliers above) pioneered the use of crystal - which has stunning refractive properties - Murano chandeliers pioneered the production of coloured glass, known as 'millefiori' (meaning 'multi-coloured'). Murano chandeliers were beautiful floral affairs, inspired by the flamboyance of the Rococo period. 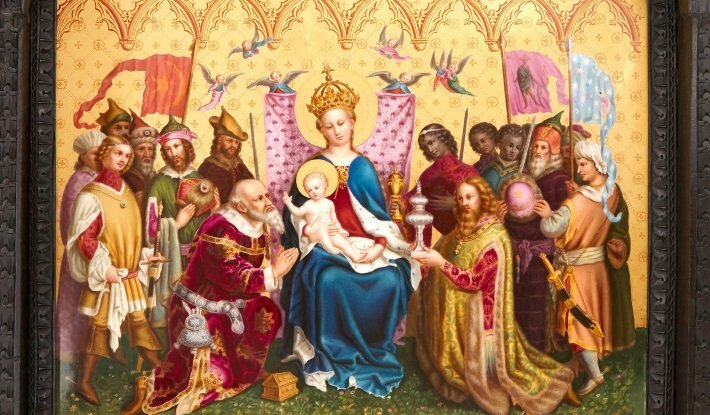 Their creations were called 'ciocca' (meaning 'a bouquet of flowers'), after the numerous indivudually blown, flower-shaped pieces of coloured glass which adorned their chandeliers. 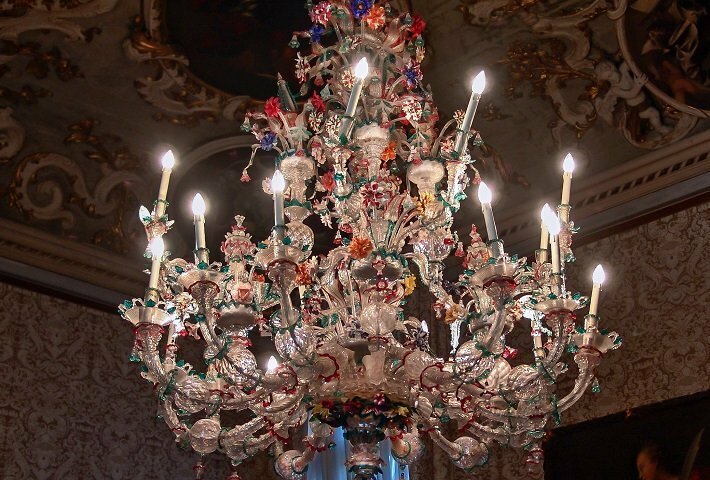 This chandelier - a classic of beautiful, intricate, floral Murano design - can be found at the Ca' Rezzonico in Venice, the famous palazzo dedicated to the art of the 18th Century. Okay, okay...so technically this one shouldn't be allowed on our list of the ten best antique chandeliers, but we've decided to include it by association with its beautiful antique surroundings. The Palace of Versailles is a monument to the opulence and grandeur of the 17th and 18th Century Baroque. Its many rooms and halls contain quite literally thousands of chandeliers, made by some of the most important artisans of the last three centuries. And yet perhaps the most intriguing of them all isn't antique at all, but this contemporary piece, installed only as recently as 2013. It made history for being the first piece of contemporary design ever allowed into the Palace, and it hangs over the staircase at the main entrance to the Palace. The chandelier, designed by French firm Studio Bouroullec, is made of 800 individual crystal modules manufactured by jewellery firm Swarovski, which enclose an LED-lit steel skeleton. The Bouroullec brothers' challenge was, as they say, to create something “delicate, different, and contemporary, yet not in violent opposition to this beautiful old space”. What they created - bold, innovative, and yet in tune with its surroundings - was a real gem of contemporary design. "Beneath the resplendent waving leaves floats an immense fiery dragon, carrying in its claws the stupendous chandelier." In a description clearly intended to provoke awe in the minds its readers, the local newspaper magnate John George Bishop wrote these words of the "suberb ornament" in the Banqueting Room of The Royal Pavilion, also known as the Brighton Pavilion. The seaside town of Brighton in the south of England had been a getaway for aristocratic inhabitants of London since the early 18th Century. The young King George IV enjoyed spending time in the town so much that he had a summer house - The Royal Pavilion - built there. The Pavilion itself is a wacky mix of styles, partly inspired by British Georgian era design, but also paying homage to Indian and Chinese arts and architecture. The Far East was especially popular during the late 18th Century and inspired a style of design known as chinoiserie. The Stupendous Chandelier in the Banqueting Room is one of the most striking of the chinoiserie-inspired pieces in the Pavilion: built by the designer Robert Jones in the early 19th Century, and measuring over 45 feet in height, the chandelier is suspended from a large silvered metal dragon which is mounted to the ceiling. The glass lights are likewise shaped to look like flames appearing from dragons' mouths. This Stupendous Chandelier really is British eccentricity at its best. The Sultan Qaboos mosque in Muscat, Oman, is the city's main and largest mosque, with room for over 20,000 worshippers. It's no wonder, then, that its designers needed to commission a suitably large chandelier to light the space. 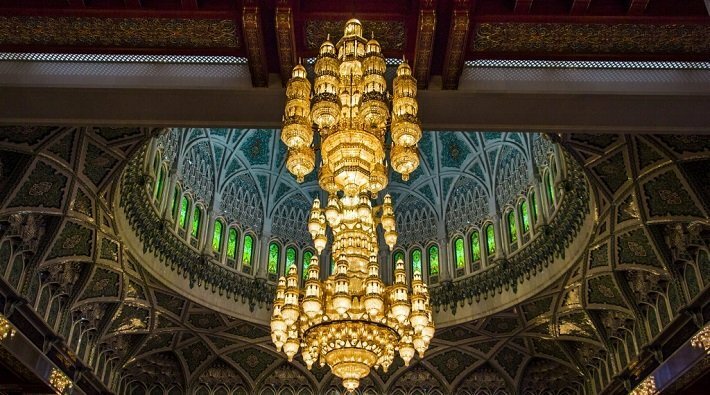 But what they commissioned went above and beyond anyone's expectations: composed of over 600,000 Swarovski crystals and lit by 1,122 individual lamps, the Sultan Qaboos Grand Mosque chandelier is the world's largest chandelier by quite some distance. It weighs at a staggering 8.5 tons, and measures over 14 metres in height and 8 metres in diameter. To put this in perspective: you could fit 80 Ford Fiestas inside this chandelier. The falling chandelier in Andrew Lloyd Webber's The Phantom of the Opera, (based on Gaston Leroux's 1910 novel) is one of the most iconic moments in West End history. What many people don't know is that it was based on a real-life incident. 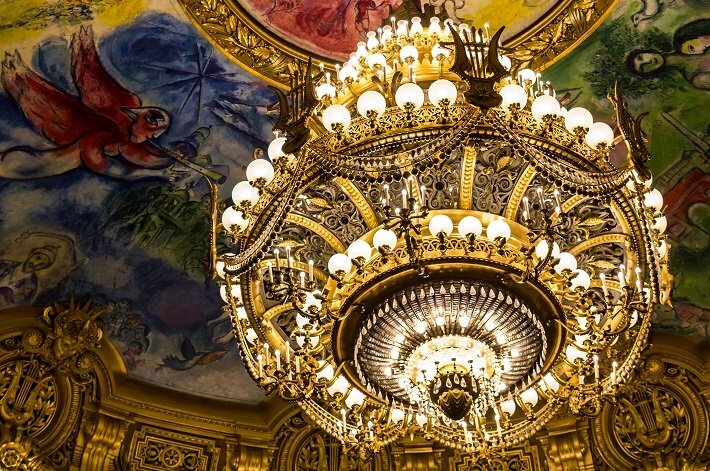 In 1896 the counterweight of the Opera Garnier chandelier in Paris became dislodged, causing the entire seven-ton bronze and crystal piece to fall. It killed a construction worker in the process. Undeterred, Garnier, designer of the chandelier and architect of the Opera building, had the chandelier rebuilt and hung once more from the Palais Garnier's ceiling. It was a move criticised not only for the potential danger, but because the enormous size of the chandelier meant that it blocked the views of anyone in the top tier of the house. Given the chandelier's intriguing history, its iconic status and its truly spectacular appearance, we're inclined to agree. The inclusion of this Baccarat crystal chandelier on the list has absolutely nothing at all to do with the fact that Mayfair Gallery happens to own an example of it, and absolutely everything to do with its virtuousic design, its sumptuous charm, and its stunning elegance. The French firm of Baccarat was founded in 1764, and by the beginning of the 19th Century, had become one of Europe's pre-eminent glass manufacturers to rival the works of Murano and Bohemia. Its real breakthrough, however, came in 1841, when the Baccarat glassmakers discovered the secret to making fine, clear glass which looked like rock crystal. It was this discovery that would propel Baccarat products to new levels of popularity and beauty. 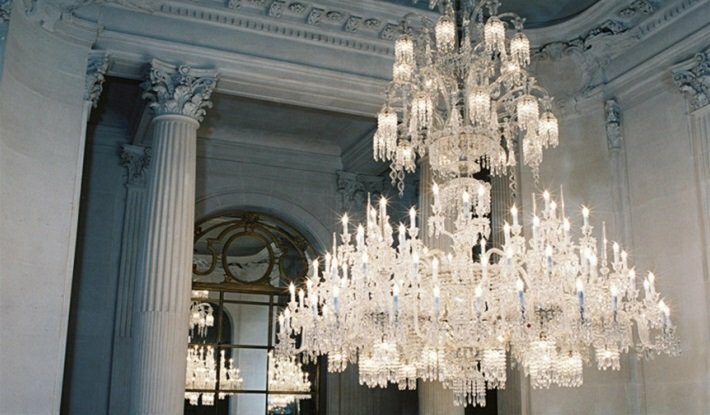 With 157 lights, graduating tiers of multiple miniature crystal hanging lanterns of crystal drops, and a crystal corona at the top, this chandelier, currently on display at the Musee Baccarat in Paris, ranks as one of the most beautiful and elegant chandeliers of all time. 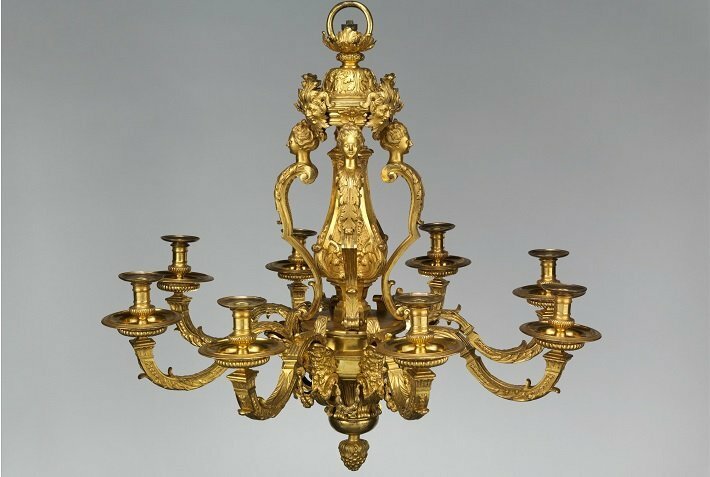 This chandelier made history for being the most expensive ever to sell at auction, fetching a staggering £6 million at Christie's in 2011. It was designed by the architect William Kent (1686-1748), built in 1736, and is made from solid silver. What is most special about the piece, however, is not just its design but its royal provenance. 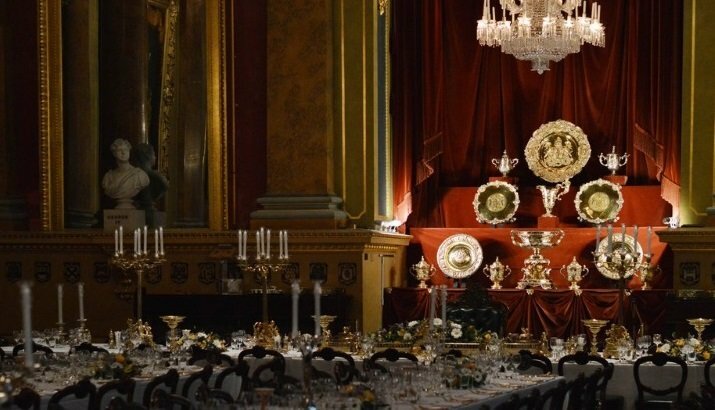 The chandelier has a fascinating history: it was commissioned by the Hanoverian King George II of England for his German palaces and stayed within his family for nearly 200 years. It has been suggested that he wanted to furnish his German palaces in order to spend more time with his new German mistress, Amalie (1704-1765), former wife of Gottlieb Adam von Wallmoden (d. 1752), the Oberhauptmann of Calenberg. 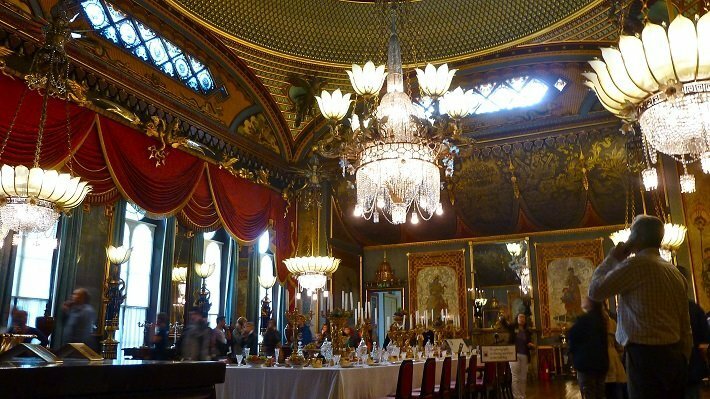 The Dolmabahce Palace in Istanbul, Turkey, is an antique chandelier-lover's heaven: it has the largest collection of 19th Century Bohemian and Baccarat crystal chandeliers in the world, and this 750-light Bohemian masterpiece is its piece de resistance. 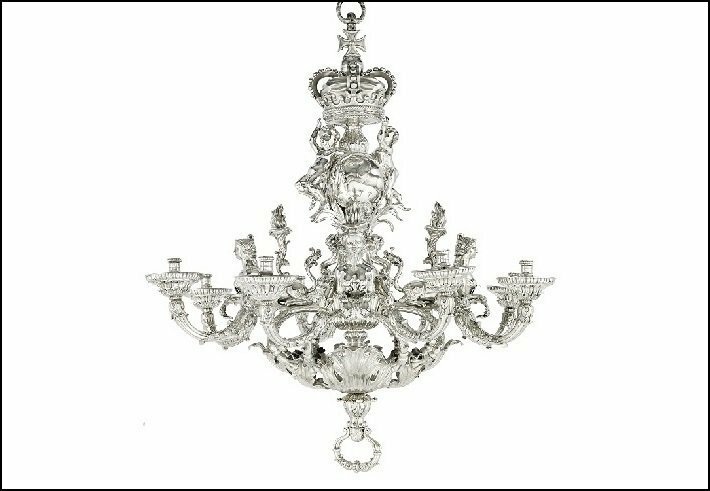 Although manufactured in Bohemia, its design is actually English and has been attributed to the master English chandelier-making firm F. & C. Osler, Queen Victoria's favourite glassmakers. At the time it was made it was the largest chandelier in the world. During the Ottoman palace's construction in the 1850s, world leaders from across Europe and the world sent gifts to help furnish the new palace. 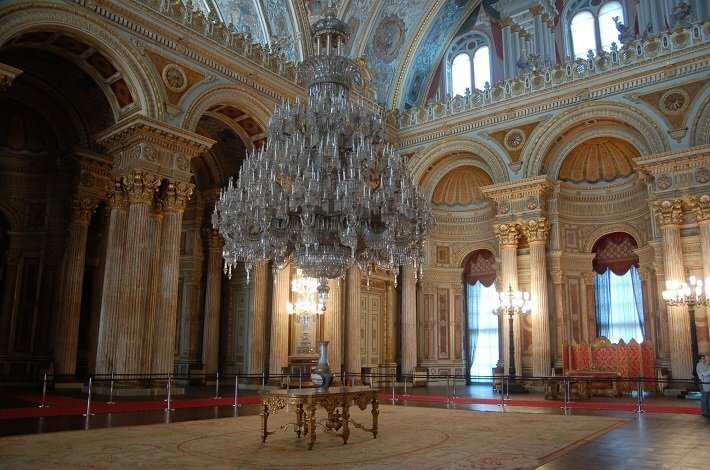 The chandelier was thought to be a gift from the British Queen Victoria, but a receipt found in 2006 showed that the Ottoman Emperor had paid for it in full. 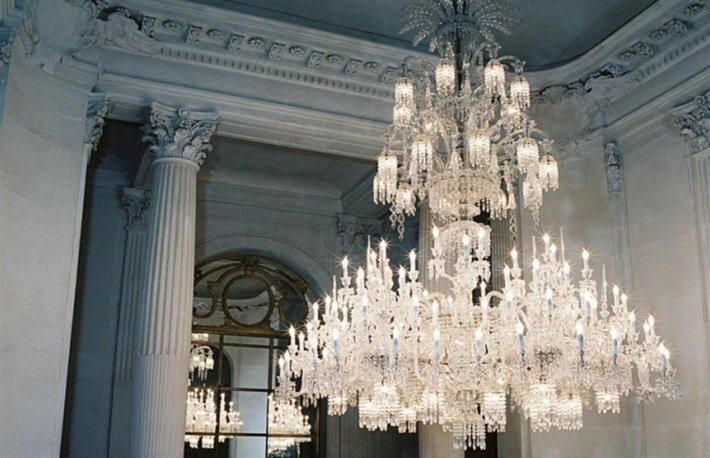 Whatever its origins, the crystal chandelier is breathtaking, and a true masterpiece of 19th Century glassmaking. 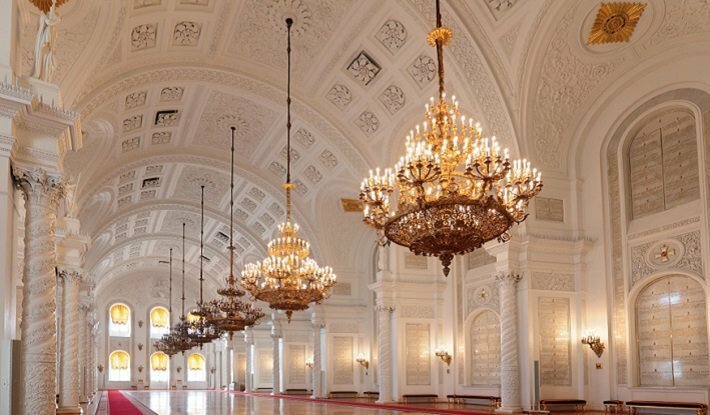 Our top ten covers the world's largest chandelier, but what about the smallest? 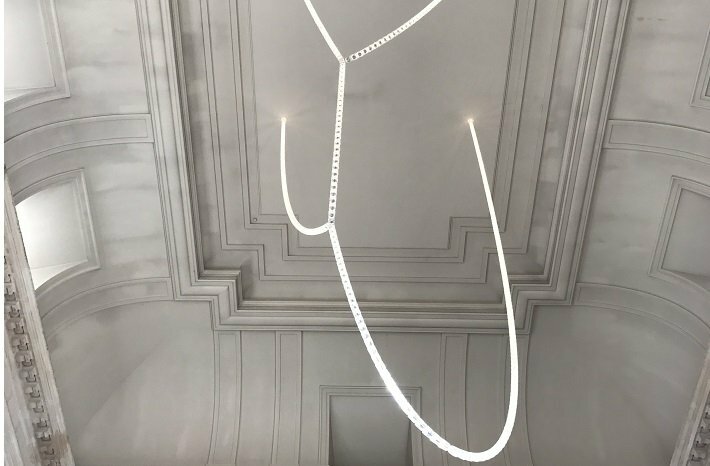 British company Mineheart claim to have created the world's smallest chandelier, a ten LED-light brass chandelier measuring just three inches wide and two inches tall. It has been designed so it can fit inside a lightbulb.